This article is about the broad-gauge streetcar system in Toronto. For standard-gauge light rail transit in Toronto, see Toronto subway § Expansion plans. Toronto's streetcars provide most of the downtown core's surface transit service. Four of the TTC's five most heavily used surface routes are streetcar routes. In 2016, ridership on the streetcar system totalled more than 95 million. Horse-drawn Toronto Street Railway streetcars, 1890. By 1894, horse-drawn streetcars were replaced by electric streetcars. In 1861, the City of Toronto issued a thirty-year transit franchise (Resolution 14, By-law 353) for a horse-drawn street railway, after the Williams Omnibus Bus Line had become heavily loaded. Alexander Easton's Toronto Street Railway (TSR) opened the first street railway line in Canada on September 11, 1861, operating from Yorkville Town Hall to the St. Lawrence Market. At the end of the TSR franchise, the City government ran the railway for eight months, but ended up granting a new thirty-year franchise to the Toronto Railway Company (TRC) in 1891. The TRC was the first operator of horseless streetcars in Toronto. The first electric car ran on August 15, 1892, and the last horse car ran on August 31, 1894, to meet franchise requirements. There came to be problems with interpretation of the franchise terms for the City. By 1912, the city limits had extended significantly, with the annexation of communities to the north (1912: North Toronto) and the east (1908: Town of East Toronto) and the west (1909: the City of West Toronto—The Junction). After many attempts to force the TRC to serve these areas, the City created its own street railway operation, the Toronto Civic Railways to do so, and built several routes. Repeated court battles forced the TRC to build new cars, but they were of old design. When the TRC franchise ended in 1921, the Toronto Transportation Commission was created, combining the city-operated Toronto Civic Railways lines into its new network. The TTC began in 1921 as solely a streetcar operation, with the bulk of the routes acquired from the private TRC and merged with the publicly operated Toronto Civic Railways. In 1923, the TTC took over the Lambton, Davenport and Weston routes of the Toronto Suburban Railway (TSR) and integrated them into the streetcar system. Opening ceremonies for the Roger Road line, in York, 1924. The TTC was contracted to operate streetcars in the township. In 1925, routes were operated on behalf of the Township of York (as Township of York Railway), but the TTC was contracted to operate them. One of these routes was the former TSR Weston route. In 1927, the TTC became the operator of three radial lines of the former Toronto and York Radial Railway. The TTC connected these lines to the streetcar system in order to share equipment and facilities, such as carhouses, but the radials had their own separate management within the TTC's Radial Department. The last TTC-operated radial (North Yonge Railways) closed in 1948. After the Second World War, many cities across North America and Europe began to eliminate their streetcar systems in favour of buses. During the 1950s, the TTC continued to invest in streetcars and the TTC took advantage of other cities' streetcar removals by purchasing extra PCC cars from Cleveland, Birmingham, Kansas City, and Cincinnati. Streetcar and trolleybus routes/tracks in October 1965. In the next year, plans were announced to eliminate the streetcar system. In 1966, the TTC announced plans to eliminate all streetcar routes by 1980. Streetcars were considered out of date, and their elimination in almost all other cities made it hard to buy new vehicles and maintain the existing ones. Metro Toronto chair William Allen claimed in 1966 that "streetcars are as obsolete as the horse and buggy". Many streetcars were removed from service when Line 2 Bloor–Danforth opened in February 1966. The plan to abolish the streetcar system was strongly opposed by many people in the city, and a group named "Streetcars for Toronto" was formed to work against the plan. The group was led by professor Andrew Biemiller and transit advocate Steve Munro. It had the support of city councillors William Kilbourn and Paul Pickett, and urban advocate Jane Jacobs. Streetcars for Toronto presented the TTC board with a report that found retaining the streetcar fleet would in the long run be cheaper than converting to buses. This combined with a strong public preference for streetcars over buses changed the decision of the TTC board. The busiest north–south and east–west routes were replaced respectively by the Yonge–University and the Bloor–Danforth subway line, and the northernmost streetcar lines, including the North Yonge and Oakwood routes, were replaced by trolley buses (and later by diesel buses). Two lines that operated north of St. Clair Avenue were abandoned for other reasons. The Rogers Road route was abandoned to free up streetcars for expanded service on other routes. The Mount Pleasant route was removed because of complaints that streetcars slowed automobile traffic. Earlier, the TTC had contemplated abandonment because replacement by trolley buses was cheaper than replacing the aging tracks. Two TTC streetcars used in the 20th century. The streetcar to the left entered service in 1979, eventually replacing the streetcar model next to it. However, the TTC maintained most of its existing network, purchasing new custom-designed Canadian Light Rail Vehicles (CLRV) and Articulated Light Rail Vehicles (ALRV), with the first CLRV entering service in 1979. It also continued to rebuild and maintain the existing fleet of PCC (Presidents' Conference Committee) streetcars until they were no longer roadworthy. When Kipling station opened in 1980 as the new western terminus of Line 2 Bloor–Danforth, it had provision for a future streetcar or LRT platform opposite the bus platforms. However, there was no further development for a surface rail connection there. In the early 1980s, a streetcar line was planned to connect Kennedy station to Scarborough Town Centre. However, as that line was being built, the Province of Ontario persuaded the TTC to switch to using a new technology called the Intermediate Capacity Transit System (now Bombardier Innovia Metro) by promising to pay for any cost overruns (which eventually amounted to over $100 million). Thus, the Scarborough RT (now Line 3 Scarborough) was born, and streetcar service did not return to Scarborough. A streetcar operating on route 510 Spadina. Streetcar service on Spadina Avenue was reintroduced in 1990. The TTC returned to building new streetcar routes in 1989. The first new line was route 604 Harbourfront, starting from Union station, travelling underneath Bay Street and rising to a dedicated centre median on Queen's Quay (along the edge of Lake Ontario) to the foot of Spadina Avenue. This route was lengthened northward along Spadina Avenue in 1997, continuing to travel in a dedicated right-of-way in the centre of the street, and ending in an underground terminal at Spadina station. At this time, the route was renamed 510 Spadina to fit with the numbering scheme of the other streetcar routes. This new streetcar service replaced the former route 77 Spadina bus, and since 1997 has provided the main north–south transit service through Toronto's Chinatown and the western boundary of University of Toronto's main campus. The tracks along Queen's Quay were extended to Bathurst Street in 2000 to connect to the existing Bathurst route, providing for a new 509 Harbourfront route from Union Station to the refurbished Exhibition Loop at the Exhibition grounds, where the Canadian National Exhibition is held. By 2003, two-thirds of the city's streetcar tracks were in poor condition as the older track was poorly built using unwelded rail attached to untreated wooden ties lying on loose gravel. The result was street trackage falling apart quickly requiring digging up everything after 10–15 years. Thus, the TTC started to rebuild tracks using a different technique. With the new technique, concrete is poured over compacted gravel, and the ties are placed in another bed of concrete, which is topped by more concrete to embed rail clips and rubber-encased rails. The resulting rail is more stable and quieter with less vibration. The new tracks are expected to last 25 years after which only the top concrete layer needs to be removed in order to replace worn rails. A streetcar operating on a reserved track on route 512 St. Clair. Dedicated right-of-way lanes were completed on route 512 in 2010. Route 512 St. Clair was rebuilt to restore a separated right-of-way similar to that of the 510 on Spadina Avenue, to increase service reliability and was completed on June 30, 2010. On December 19, 2010, 504 King streetcar service returned to Roncesvalles Avenue after the street was rebuilt to a new design which provided a widened sidewalk "bumpout" at each stop to allow riders to board a streetcar directly from the curb. When no streetcar is present, cyclists may ride over the bumpout as it is doubles as part of a bike lane. On October 12, 2014, streetcar service resumed on 509 Harbourfront route after the street was rebuilt to a new design that replaced the eastbound auto lanes with parkland from Spadina Avenue to York Street. Thus, streetcars since then run on a roadside right-of-way immediately adjacent to a park on its southern edge. The Toronto Transit Commission eliminated all Sunday stops on June 7, 2015, as these stops slowed down streetcars making it more difficult to meet scheduled stops. Sunday stops, which served Christian churches, were deemed unfair to non-Christian places of worship, which never had the equivalent of a Sunday stop. Toronto originally created Sunday stops in the 1920s along its streetcar routes to help worshippers get to church on Sunday. The first two Flexity Outlook streetcars entered service on route 510 Spadina, on August 31, 2014. On November 22, 2015, the TTC started to operate its new fleet of Flexity Outlook streetcars from its new Leslie Barns maintenance and storage facility. On December 14, 2015, the TTC introduced Presto, proof-of-payment and all door loading for all streetcars on all routes. All streetcar passengers are required to carry proof that they have paid their fares such as a validated TTC ticket, paper transfer or Presto card while riding. With the January 3, 2016, service changes, 510 Spadina became the first wheelchair-accessible streetcar route using mainly Flexity streetcars. However, CLRV and/or ALRV streetcars were to be used as backup in the event of an insufficient availability of Flexity streetcars. On June 19, 2016, the TTC launched the 514 Cherry streetcar route, to supplement 504 King service along King Street between Dufferin and Sumach streets. The new route operated every 15 minutes or better and initially used some and later only the Commission's new accessible Flexity streetcars. The eastern end of the 514 route ran on a newly constructed branch, originally named the Cherry Street streetcar line, which is located in a reserved side-of-street right-of-way. On September 12, 2017, 509 Harbourfront became the first streetcar route in Toronto to operate Flexity streetcars with electrical pickup by pantograph instead of trolley pole. On November 12, 2017, a transit mall was installed along King Street between Bathurst and Jarvis streets. On October 7, 2018, the 514 Cherry route was permanently cancelled. The service it provided was replaced by the 504 King, which was divided into two overlapping branches, each to one of the termini (Dufferin Gate Loop and Distillery Loop) of the former 514 route. On December 16, 2010, the TTC suffered its worst accident since the Russell Hill subway crash in 1995. Up to 17 people were sent to hospital with serious but non-life-threatening injuries after a 505 Dundas streetcar heading eastbound collided with a Greyhound bus at Dundas and River Streets. Based on 2013 statistics, the TTC operated 304.6 kilometres (189.3 mi) of routes on 82 kilometres (51 mi) streetcar network (double or single track) throughout Toronto. There are 10 regular streetcar routes on the TTC network. As of 2019, the route is operated primarily with a mixture of CLRVs and Flexities (and sometimes, but rarely, the ALRV) between Neville Park and Humber, and CLRVs from Humber to Long Branch. Route is fully operated with new accessible low-floor Flexity Outlook streetcars, however stops along Roncesvalles Avenue between Queen Street and Dundas West station are not yet accessible due to platform height issues preventing the loading ramp on the new low-floor streetcars to open. As of 2017, delivery problems with the new Flexity streetcars led to a shortage of streetcars. Because of that shortage, as well as construction projects, some streetcar routes are temporarily replaced partly or entirely with buses. Some routes operate wholly or partly within their own rights-of-way, and stop on demand at frequent stops. Until 1980, streetcar routes had names but not numbers. When the CLRVs were introduced, the TTC assigned route numbers in the 500 series. CLRVs have a single front rollsign showing various combinations of route number and destination, while PCC streetcars showed a route identifier (route name until the 1980s and later route number) and destination on two separate front rollsigns. The digital destination signs on the new Flexity Outlook streetcars show route number, route name and destination. Before 2018, streetcar-replacement bus services indicated route number and destination but not route name, like the CLRVs. The four streetcar-operated Blue Night Network routes have been assigned 300-series route numbers. The other exception to the 500 series numbering was the Harbourfront LRT streetcar. When introduced in 1990, this route was numbered 604, which was intended to group it with the old numbering scheme for rapid transit routes. In 1996, the TTC overhauled its rapid transit route numbers and stopped trying to market the Harbourfront route as 'rapid transit'. The number was changed to 510. The tracks were later extended in two directions to form the 510 Spadina and 509 Harbourfront routes. During times when streetcar service on all or a portion of a route has been replaced temporarily by buses (e.g., for track reconstruction, major fire, special event, lack of available streetcars), the replacement bus service is typically identified by the same route number as the corresponding streetcar line. A streetcar at Main Street station's streetcar connection. A number of Toronto subway stations provide connections to streetcars. There are underground connections between streetcars and the subway at St. Clair West, Spadina, and Union stations, and streetcars enter St. Clair, Dundas West, Bathurst, Broadview, and Main Street stations at street level. At the eight downtown stations, excepting Union, from Queen's Park to College on Line 1 Yonge–University, streetcars stop on the street outside the station entrances. Union station serves as the hub for both the TTC and the GO train system. The majority of streetcar routes in Toronto operate in mixed traffic, reflecting the original track configurations of the streetcar system. The majority of streetcar routes in Toronto operate in mixed traffic, generally reflecting the original track configurations of the streetcar system, a system that dates back to the late 19th and early 20th centuries. However, newer trackage has largely been established within dedicated rights-of-way, in order to allow streetcars to operate with fewer disruptions due to delays caused by automobile traffic. Most of the system's dedicated rights-of-way operate within the median of existing streets, separated from general traffic by raised curbs and controlled by specialized traffic signals at intersections. Queen streetcars have operated on such a right-of-way along the Queensway between Humber and Sunnyside loops since 1957. Since the 1990s, dedicated rights-of-way have been opened downtown along Queens Quay, Spadina Avenue, St. Clair Avenue West, and Fleet Street. Short sections of track also operate in tunnel (to connect with Spadina, Union, and St. Clair West subway stations). The most significant section of underground streetcar trackage is a tunnel underneath Bay Street connecting Queens Quay with Union Station; this section, which is approximately 700 m (2,300 ft) long, includes one intermediate underground station at Bay Street and Queens Quay. During the late 2000s, the TTC reinstated a separated right-of-way — removed between 1928 and 1935 — on St. Clair Avenue, for the entire 512 St. Clair route. A court decision obtained by local merchants in October 2005 had brought construction to a halt and put the project in doubt; the judicial panel then recused themselves, and the delay for a new decision adversely affected the construction schedule. A new judicial panel decided in February 2006 in favour of the city, and construction resumed in mid-2006. One-third of the St. Clair right-of-way was completed by the end of 2006 and streetcars began using it on February 18, 2007. The portion finished was from St. Clair station (Yonge Street) to Vaughan Road. The second phase started construction in mid-2007 from Dufferin Street to Caledonia Road. Service resumed using the second and third phases on December 20, 2009 extending streetcar service from St. Clair to Earlscourt Loop located just south and west of Lansdowne Avenue. The fourth and final phase from Earlscourt Loop to Gunns Loop (just west of Keele Street) is completed and full streetcar service over the entire route was finally restored on June 30, 2010. Route 509 Harbourfront is one of several TTC streetcar rotues that feature dedicated right-of-way lanes. Between September 2007 and March 2008, the tracks on Fleet Street between Bathurst Street and the Exhibition Loop were converted to a dedicated right-of-way and opened for the 511 Bathurst and the 509 Harbourfront streetcars. Streetcar track and overhead power line were also installed at the Fleet loop, which is located at the Queen's Wharf Lighthouse. The eastern portion of the 504A King route runs on a side-of-street right-of-way. It was constructed starting in 2012 to support redevelopment in the West Don Lands and the Distillery District, former industrial areas. As part of the King Street Pilot Project, a temporary transit mall was set up along King Street for a one-year trial period starting in mid-November 2017. Although not a dedicated right-of-way, the transit mall achieves the goal of preventing road traffic from impeding streetcar service. Road traffic is discouraged from using the mall by being forced to leave the mall via a right turn at most signalized intersections. This project has since been extended. The City of Toronto's and the TTC's Transit City report released on March 16, 2007, proposed creating new light rail lines. These are mainly separate from the streetcar network as the track gauge and vehicle specifications are quite different. Much of the original proposal has since been cancelled, and those light-rail lines that are proceeding are classified as part of the Toronto subway system. The Waterfront West LRT would run from Long Branch Loop along Lake Shore Boulevard and the Queensway to Colbourne Lodge Drive and then adjacent to the Lake Shore Boulevard to Exhibition Loop and onto Union subway station via Queens Quay. This line originated from the Transit City proposals. It was shelved in 2013 but recommended for reconsideration in 2015 by city staff. In 2017, the TTC revised the proposal as summarized here. The East Bayfront LRT is planned to run along Queens Quay East from Union station to complement the 509 Harbourfront line. 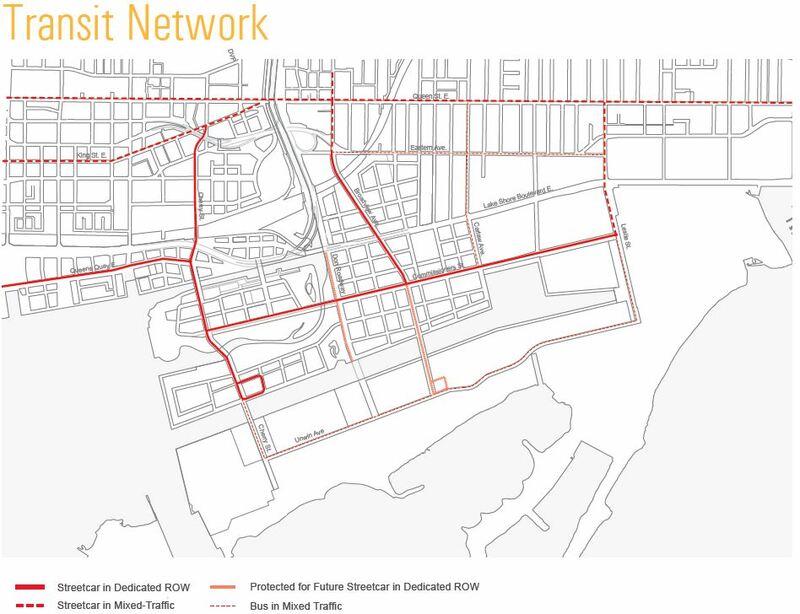 Waterfront Toronto is recommending the creation or extension of three streetcar lines in the Port Lands. Both the Cherry Street streetcar line and East Bayfront LRT would be extended to Queens Quay and Parliament Street. From there, one line would run south on Cherry Street to the Ship Channel and another east along Commissioners Street to Leslie Street. Another line would be built along an extended Broadview Avenue south from Queen Street to Commissioners Street. Routes with "Transferred to City" in the "Ended" column were operating on May 20, 1891, when the Toronto Street Railway Company's franchise expired and had their operations taken over by the City of Toronto. Bathurst September 1889 December 7, 1889 To "Seaton Village"
Brockton September 4, 1883 May 1884 From "Queen & Brockton"; to "Queen & Brockton"
Davenport August 18, 1890 Transferred to City From "Seaton Village"
Dovercourt via McCaul September 24, 1888 Transferred to City From "McCaul & College"
Front & McCaul October 22, 1883 June 28, 1884 To "McCaul & College"
Front & Parliament November 25, 1878 July 25, 1881 To "Parliament" and "Winchester"
High Park via Queen April 1887 Transferred to City From "Queen & Parkdale"
King via Strachan September 2, 1879 September 19, 1890 During Toronto Industrial Exhibition only; to "King"
Kingston Rd. June 9, 1875 April 1887 Kingston Road Tramway Co.; by this date; part to "Woodbine"
McCaul & College June 30, 1884 September 22, 1888 From "Front & McCaul"; to "Dovercourt via McCaul"
McCaul & College July 15, 1889 Transferred to City From "Dovercourt via McCaul"
Parliament July 26, 1881 Transferred to City to City from "Front & Parliament"
Queen February 2, 1861 December 7, 1881 to "Queen & Brockton"
Queen September 4, 1883 May 1884 From "Queen & Brockton"; to "Queen & Brockton"
Queen & Brockton December 8, 1881 September 3, 1883 From "Queen"; to "Queen & Brockton"
Queen & Brockton May 1884 Transferred to City From "Brockton" and "Queen"
Queen & Parkdale September 2, 1879 April 1887 Ended by Q2 1887; to "High Park via Queen"
Queen East May 11, 1885 Transferred to City From "Sherbourne"
Seaton Village July 27, 1885 Transferred to City From "Spadina & Bathurst"
Spadina & Bathurst June 30, 1884 July 25, 1885 From "Spadina"; to "Seaton Village"
Winchester July 26, 1881 Transferred to City From "Front & Parliament"
Woodbine May 21, 1887 Transferred to City From "Kingston Rd." Routes marked to TTC were operating on September 21, 1921, when the Toronto Railway Company's operations were taken over by the Toronto Transportation Commission. Arthur 1902-02-12 February 12, 1902 1909-00-00 1909 merged with "Dundas"
Ashbridge 1917-11-05 November 5, 1917 to TTC replaced by bus service in the 1920s. Brockton 1882-00-00 1882 1893-10-09 October 9, 1893 renamed "Dundas"
Danforth 1889-05-00 May 1889 1892-10-00 October 1892 renamed "Broadview"
Davenport 1892-12-00 December 1892 1891-11-00 November 1891 replaced by "Bathurst", "Parliament" and "Winchester"
Dufferin 1889-00-00 1889 1891-09-30 September 30, 1891 merged with "Danforth"
Lee Avenue 1889-0—00 1889 1893-05-15 May 15, 1893 merged into "King"
McCaul 1883-10-00 October 1883 1896-01-01 January 1, 1896 replaced by "Bloor"
Parkdale 1880-00-00 1880 1886-00-00 1886 renamed "High Park"
Parliament 1881-00-00 1881 1918-03-04 March 4, 1918 merged into "Queen"
Queen East 1882-00-00 1882 1891-10-16 October 16, 1891 merged with "Danforth"
Roncesvalles 1909-00-00 1909 1911-12-20 December 20, 1911 replaced by "Queen"
Seaton Village 1885-07-27 July 27, 1885 1891-10-23 October 23, 1891 replaced by "Davenport", "Parliament" and "Winchester"
Sherbourne 1874-11-00 November 1874 1891-11-16 November 16, 1891 merged into "Belt Line"
Spadina 1878-00-00 1878 1891-11-16 November 16, 1891 merged into "Belt Line"
Woodbine 1887-05-00 May 1887 1893-04-04 April 4, 1893 replaced by "King"
All routes transferred to the Toronto Transportation Commission. Belt Line 1891 1923 After 1923, Spadina, Bloor, King and Sherbourne streetcar routes took over operations. Only King and Spadina are still streetcar routes with the remainder replaced by subway or bus service. Dundas Exhibition 1980 1986 522 Also operated during the 1995 season and the 2013 Canadian National Exhibition. Lake Shore 1995 2015 508 Cancelled due to streetcar shortage. Queen section now served by 501 Queen and King section by 504 King. Winchester 1910 1924 Replaced by Yonge and Parliament streetcars (former replaced by subway in 1954 and latter by bus route in 1966); bus route from Parliament Street east to Sumach Street from 1924 to 1930. Rogers Road 1922 1974 Replaced by 63F Ossington via Rogers trolleycoach, 48 Humber Blvd from 1974 to 1994 and diesel buses from 1992 onwards. In 1994, 161 Rogers Road service replaced both 63F Ossington and 48 Humber Blvd. Yonge 1861 1954 Replaced by Line 1 Yonge–University subway, Downtown bus (97 Yonge beginning in 1956), and Yonge trolleycoach until 1973 (replaced with diesel buses). Peter Witt streetcars operated by the TTC, 1925. The Witt streetcar was ordered by the TTC in the early 1920s. When the TTC was created in 1921, it acquired hundreds of cars from its two predecessor companies: the Toronto Railway Company and the Toronto Civic Railways. In 1927, the TTC acquired the radial cars of the former Toronto & York Radial Railway when it took over operation of that system from the Hydro-Electric Railways. In the 1920s, the TTC purchased new Peter Witt streetcars, and they remained in use into the 1960s. In 1938, the TTC started to operate its first Presidents' Conference Cars (PCC), eventually operating more than any other city in North America. In 1979, the Canadian Light Rail Vehicles entered revenue service, followed by their longer, articulated variants, the ALRVs, in 1988. The last of the PCC vehicles were retired from full-time revenue service in the 1990s. On August 31, 2014, the TTC started operating its first Bombardier Flexity Outlook vehicles. As more of these new vehicles arrived and entered service, older CLRV and ALRV vehicles were gradually retired from service. 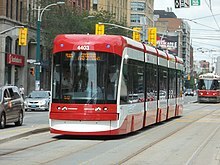 As of 2018[update], the TTC has experienced a streetcar shortage not only because of delivery delays of the new Flexity streetcars but also because of a 20% increase in streetcar ridership since 2008. The streetcar fleet capacity has not grown for almost three decades after the CLRVs and ALRVs were added. After delivery of the last of the initial 204 Flexity cars ordered, the TTC plans to purchase another 60 cars; however, the TTC estimates that would only satisfy demand until 2023 instead of 2027 as originally planned. Bombardier may have the edge on a second order as, if the TTC went with another supplier, a prototype modified for Toronto's track characteristics would not be ready until 2023 with first delivery in 2024 or 2025. The following table summarizes streetcars purchased by the TTC since 1921, or in the case of the Flexity Outlook, streetcars on order. The main article has more details on rosters, including streetcars inherited from the Toronto Railway Company and the Toronto Civic Railways which are not summarized here. Older streetcar models used by the TTC, like the ALRVs and CLRVs, receives their electricity by trolley pole. The older CLRV and ALRV streetcars have only a trolley pole. New Flexity Outlook streetcars are delivered with both a pantograph as well as a trolley pole. All streetcars in service had been using the trolley pole until September 12, 2017, when 509 Harbourfront became the first route to use the pantograph. With the introduction of the new Flexity streetcars, the TTC plans to convert the entire system to be pantograph-compatible. The new streetcars need 50% more electrical current than the older streetcars, and use of the trolley pole limits the amount of electricity the new cars can draw from the overhead wire, resulting in reduced performance. One consequence of trolley pole use on the Flexity streetcars is that air conditioning does not function in summer. Since 2008, the TTC has been converting the streetcar overhead wire to be compatible for pantograph electrical pickup as well as for trolley poles. The overhead over the Fleet Street tracks was the first to be so converted. The new overhead uses different hangers so that pantographs do not strike supporting crosswires. It also uses a different gauge of wire to handle the higher electrical demands of Flexity Outlook streetcars. The streetcar to the left uses a pantograph, while the one on the right uses a trolley pole. Conversion of the overhead wire to be compatible with pantographs began in 2008. During a rainy period in February 2018, the TTC received an incentive to expedite the conversion of the electrical overhead for pantograph use by the Flexity streetcars. On February 20, 2018, Flexity streetcars using trolley poles were pulling down some of the overhead. In Toronto, the tip of the trolley pole has a shoe with a carbon insert to collect current. The carbon insert also lowers the trolley shoe so that it does not strike hangers that are not yet pantograph-compatible. During wet weather, these carbon inserts wear out faster needing replacement after a day or two for older streetcars. However, because the Flexity streetcars draw more current than older streetcars, their carbon inserts wore out faster in less than 8 hours in the wet weather. (There was also an issue with the quality of carbon the TTC purchased.) With pantographs, this would be less of a problem as the pantograph blades have a larger contact area than a trolley shoe to absorb wear. Because of this incident, the TTC decided it should accelerate the conversion of overhead for pantograph use. The fleet of CLRV and ALRV experienced operational issues during extreme cold temperatures in early 2015 as doors and brakes failed as moisture in the pneumatic lines froze. Moisture also caused track sanders to fail. Buses were used to replace streetcars unfit for service, some of which had failed while in service. The new Flexity cars, which use electronic braking and door operations, were unaffected by the weather. Cold temperatures in late 2017 and early 2018 caused the same mechanical failures, making about a third of the legacy streetcars inoperable, necessitating the use of buses to cover the shortfall. During an extreme cold snap between January 20 and 21, 2019, the TTC did not operate any of the CLRV/ALRV streetcars due to the high risk of breakdowns. Instead, only the Flexity Outlook streetcars, supplemented with buses, were used to provide streetcar line service. The streetcar overhead is vulnerable during freezing rain storms. During such storms, the TTC applies anti-freeze to the overhead wire to prevent ice from interrupting electrical contact. In addition, the TTC attaches "sliders" to trolley poles on every fifth streetcar to knock ice off the overhead wire. The TTC places overhead crews on standby at various locations around the streetcar network to address problems of power loss or overhead wires coming down. The anti-freeze used on the overheard wire is also applied to streetcar switches on the network. In addition, the TTC runs "storm cars" on all routes to prevent any ice build-up on switches that the anti-freeze could not prevent. These measures are applied only during freezing rain. However, during the ice storm of April 14–16, 2018, the TTC also used bus substitution on portions of the streetcar network outside the downtown area in order to concentrate streetcars and emergency crews into a smaller area. The tracks of Toronto's streetcars and subways are built to the unique track gauge of 4 ft 10 7⁄8 in (1,495 mm), 2 3⁄8 in (60 mm) wider than the usual 4 ft 8 1⁄2 in (1,435 mm) standard gauge, which Line 3 Scarborough uses. Though often colloquially called the Toronto gauge, according to Steve Munro, TTC gauge is "English carriage gauge". That the gauge of the said railways shall be such that the ordinary vehicles now in use may travel on the said tracks, and that it shall and may be lawful to and for all and every person and persons whatsoever to travel upon and use the said tracks with their vehicles loaded or empty, when and so often as they may please, provided they do not impede or interfere with the cars of the party of the second part (Toronto Street Railway), running thereon, and subject at all times to the right of the said party of the second part, his executors, and administrators and assigns to keep the said tracks with his and their cars, when meeting or overtaking any other vehicle thereon. As wagons were normally built at standard gauge, the streetcar rails were selected to be slightly wider, allowing the wagons to ride on the inside sections of the rail, and the streetcars on the outside. The Williams Omnibus Bus Line changed the gauge of their buses in 1861 to fit this gauge. At the time, track for horsecars was not our modern 'T' rail, but wide and flat, with a raised section on the outside of the rail. A curve along the streetcar track. 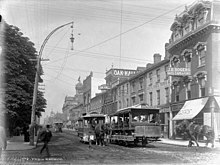 According to the TTC, the City of Toronto feared that the street railway franchise operator, first in 1861, the Toronto Street Railway, then in 1891, the Toronto Railway Company, and in 1921, the TTC, would allow the operation of steam locomotives and freight trains through city streets, as was common practice in Hamilton, Ontario (until the 1950s) and in many US cities, such as New York City and Syracuse, New York. Standard gauge tracks in the streets would have allowed this, but steam railway equipment could not follow the abrupt curves in the streetcar network. Opposition to freight operation in city streets precluded interchange even with adjacent radial lines even after the lines changed to TTC gauge. Electric railway freight cars could negotiate street curves, but freight operations to downtown were still not allowed until the final few years of radial operation by the TTC. The unique gauge has remained to this day because the integrated nature of the streetcar network makes it impossible to replace the gauge on part of the network without closing the entire network, which would be unacceptable given the extent of the system and its importance to transportation in Toronto. Some proposals for the city's subway system involved using streetcars in the tunnels, possibly having some routes run partially in tunnels and partially on city streets, so the Toronto subway was built using the same gauge as streetcars, although ultimately, streetcars were never used as part of the subway system. Besides the Toronto streetcar and subway systems, the Halton County Radial Railway uses the Toronto gauge of 4 ft 10 7⁄8 in (1,495 mm) for its museum streetcar line. Before TTC ownership, however, the streetcar gauge was either 4 ft 10 3⁄4 in (1,492 mm) or 4 ft 11 in (1,499 mm), depending on the historical source, instead of today's 4 ft 10 7⁄8 in (1,495 mm). According to Raymond L. Kennedy said: "The street railways were built to the horse car gauge of 4 feet 10 and 3/4 inches. (The TTC changed this to 4 10 7/8 and is still in use today even on the subway. [sic])" James V. Salmon said the "city gauge" was 4 ft 10 3⁄4 in. Both these sources were describing a former streetcar junction at the intersection of Dundas and Keele Streets laid entirely to Toronto streetcar gauge until August 1912. The junction was used by both the Toronto Suburban Railway and the Toronto Railway Company. However, Ken Heard, Consultant Museologist, Canadian Museums Association, was reported to say: "One of the terms of these agreements was that the track gauge was to accommodate wagons. As horse car rail was step rail, the horse cars, equipped with iron wheels with flanges on the inside, ran on the outer, or upper step of the rail. Wagon wheels naturally did not have a flange. They were made of wood, with an iron tire. Wagons would use the inner, or lower step of the rail. The upper step of the rail guided the wagons on the track. In order to accommodate this arrangement, the track gauge had to be 4 feet, 11 inches. As the streets themselves were not paved, this arrangement permitted wagons carrying heavy loads a stable roadbed." In support of Heard's statement about the pre-TTC gauge, the Charter of the Toronto Railway Company said "the gauge of system (4 ft. 11 in.) is to be maintained on main lines and extensions thereof". Queens Quay is the one standalone underground station that does not connect to the subway. It is located in the tunnel, shared by the 509 Harbourfront and 510 Spadina routes, between Queens Quay West and Union subway station. Since all of Toronto's current streetcars are single-ended, turning loops are provided at the normal endpoints of each route and at likely intermediate turnback locations. A routing on-street around one or more city blocks may serve as a loop, but most loops on the system are wholly or partly off-street. Many of these are also interchange points with subway or bus services. St. Clair (Wychwood) Carhouse Wychwood south of St. Clair Avenue West 1914 1978 Built for the Toronto Civic Railways in 1914 and expanded 1916. Acquired by TTC in 1921 with renovations and renamed as Wychwood Barns; closed in 1978 after cars moved to Roncesvalles but continued to be used for storage until the 1990s; tracks removed and restored as community centre. ^ a b c "Toronto's Streetcar Network – Past to Present – History". 2013. Retrieved July 26, 2013. ^ a b c "2013 TTC Operating Statistics". Toronto Transit Commission. 2014. Retrieved October 4, 2014. ^ "Public Transportation Ridership Report Fourth Quarter 2016" (PDF). American Public Transportation Association (APTA). March 3, 2017. p. 34. Retrieved November 12, 2017. ^ a b "Public Transportation Ridership Report Fourth Quarter 2016" (PDF). American Public Transportation Association (APTA). March 3, 2017. p. 31. Retrieved November 12, 2017. ^ Costa, Alvaro; Fernandes, Ruben (February 2012). "Urban public transport in Europe: Technology diffusion and market organisation". Transportation Research Part A: Policy and Practice. 46 (2): 269–284. doi:10.1016/j.tra.2011.09.002. Retrieved February 13, 2015. ^ Bragg, William (November 13, 1967). "Our Streetcars are Near the End of the Line". Toronto Star. p. 7. ^ Thompson, John (April 5, 2017). "Renewing TTC's surface-running streetcar track". Railway Age. Retrieved April 7, 2017. The Toronto Transit Commission (TTC) owns and operates more than 200 single-track miles of surface streetcar track, including loops, yards and carhouses. ^ Cal, Craig (December 1, 2007). "Streetcars for Toronto – 35th Anniversary". Spacing. Archived from the original on November 28, 2010. ^ Bow, James (August 14, 2017). "The Township of York Railways (Deceased)". Transit Toronto. Retrieved October 20, 2017. ^ Bow, James (April 21, 2013). "The Mount Pleasant Streetcar (Deceased)". Transit Toronto. Retrieved October 20, 2017. ^ "Kipling". Transit Toronto. Retrieved December 14, 2017. A cutaway of the elevations of Kipling and Kennedy station, showing planned LRT platforms. Image courtesy the Toronto Archives and Nathan Ng's Station Fixation web site. ^ "Frequently Asked Questions About Toronto's Subway And The Scarborough RT". Transit Toronto. July 20, 2017. Retrieved December 14, 2017. Why was the Kennedy RT station renovated so soon after it was built? ^ Munro, Steve (October 25, 2009). "Streetcar Track Replacement Plan 2010–2014". Steve Munro. Retrieved October 25, 2009. ^ Abbate, Gay (July 14, 2003). "State of tracks forces streetcars to crawl". The Globe and Mail. Retrieved July 14, 2003. ^ Alter, Lloyd (November 25, 2013). "Streetcars save cities: A look at 100 years of a Toronto streetcar line". TreeHugger. Archived from the original on November 26, 2013. Retrieved November 25, 2013. A hundred years ago, a new streetcar line was installed on St. Clair Avenue in Toronto in a dedicated right-of-way. In 1928 they got rid of the right-of-way to make more room for cars; In 2006 they rebuilt it again, putting the right of way back. ^ "Lanes, tracks and bikes". Roncesvalles Village BIA. ^ Munro, Steve (December 19, 2010). "Parliament and Roncesvalles 2010 Track Work". Steve Munro. Retrieved December 19, 2010. ^ Munro, Steve (October 12, 2014). "Streetcars Return to Queens Quay". Steve Munro. Retrieved October 12, 2014. ^ Andrew-Gee, Eric (May 7, 2015). "Sunday streetcar stops near churches to be shuttered in June". Toronto Star. Retrieved May 7, 2015. ^ "TTC's new streetcar facility to enter service this Sunday". Toronto Transit Commission. November 20, 2015. ^ "Proof-of-Payment (POP)". Toronto Transit Commission. Retrieved December 6, 2015. ^ Munro, Steve (December 4, 2015). "TTC Service Changes Effective January 3, 2016". Retrieved December 6, 2015. ^ a b "Introducing 514 Cherry". Toronto Transit Commission. June 20, 2016. Retrieved December 14, 2017. ^ a b Morrow, Adrian (May 25, 2012). "A tiny perfect streetcar line is being laid along Cherry Street". The Globe and Mail. Retrieved July 19, 2012. ^ a b Munro, Steve (September 12, 2017). "Pantographs Up On Harbourfront". Steve Munro. Retrieved September 15, 2017. ^ "King Street pilot to launch in November — but not everyone's happy about it". Canadian Broadcasting Corporation. October 26, 2017. Retrieved October 30, 2017. ^ Spurr, Ben (November 8, 2017). "Street overhaul that puts transit first set to launch on King St". Toronto Star. Retrieved November 9, 2017. ^ "The current section is Service Advisories 504 King and 514 Cherry route changes". Toronto Transit Commission. October 7, 2018. Archived from the original on September 25, 2018. Retrieved October 7, 2018. ^ Doherty, Brennan (June 18, 2016). "TTC launches new 514 Cherry St. streetcar route". Toronto Star. Retrieved June 18, 2016. ^ "October 7, 2018 to November 17, 2018" (PDF). Toronto Transit Commission. October 7, 2018. Retrieved October 9, 2018. ^ Byford, Andy (December 20, 2016). "New Streetcar Delivery and Claim Negotiation Update" (PDF). Toronto Transit Commission. Retrieved April 4, 2017. ^ "Accessible streetcar service updates". Toronto Transit Commission. November 12, 2017. Retrieved December 13, 2017. ^ Bow, James (February 7, 2017). "The Canadian Light Rail Vehicles (The CLRVs)". Transit Toronto. Retrieved October 21, 2017. Some Torontonians also didn't like it when the streetcar route names like QUEEN and KING were removed from the front rollsigns, in favour of route numbers like 501 and 504, and some blamed the CLRV's single rollsign design for this change. ^ Bow, James (November 10, 2006). "Route 509 – The New Harbourfront Streetcar". Transit Toronto. Retrieved July 21, 2007. ^ Kalinowski, Tess (June 30, 2010). "Finally, St. Clair streetcar fully restored". The Star. Toronto. ^ Rider, David (December 12, 2017). "King St. pilot project moving streetcar riders quicker, city says". Toronto Star. Retrieved December 13, 2017. ^ "Transit City". City of Toronto. Retrieved July 21, 2007. ^ a b "Waterfront Transit Update" (PDF). Toronto Transit Commission. November 13, 2017. Retrieved November 13, 2017. ^ "Port Lands + South of Eastern – Transportation + Servicing" (PDF). Waterfront Toronto. November 11, 2015. Retrieved November 20, 2015. ^ Bromley, John F. (October 25, 2001). "Toronto Street Railway Routes". Transit Canada. Retrieved January 9, 2011. ^ Pursley, Louis H. (1958). Street Railways of Toronto: 1861–1921. Los Angeles: Interurbans Press. pp. 39–45. ^ Bow, James (April 3, 2012). "The Ashbridge Streetcar (Deceased)". Transit Toronto. Retrieved July 19, 2012. ^ John F. Bromley (1979). TTC '28; the electric railway services of the Toronto Transportation Commission in 1928. Upper Canada Railway Society. Retrieved May 5, 2016. ^ Thompson, John (January 5, 2018). "The car that saved Toronto's streetcars". Railway Age. Retrieved January 11, 2018. ^ Bow, James (January 30, 2017). "The Articulated Light Rail Vehicles (The ALRVs)". Transit Toronto. Retrieved January 11, 2018. ^ Spurr, Ben (June 6, 2018). "Bombardier has inside track for TTC's next streetcar order". Toronto Star. Retrieved June 6, 2018. ^ "A History of Toronto's Presidents' Conference Committee Cars (the PCCs) – Transit Toronto – Content". transit.toronto.on.ca. Retrieved April 18, 2016. ^ Spurr, Ben (November 12, 2018). "TTC spent $26 million to save 30 aging streetcars. But majority of the vehicles are still in the garage in need of more repairs". Toronto Star. Retrieved November 13, 2018. ^ "New Streetcar Implementation Plan" (PDF). Toronto Transit Commission. June 24, 2013. p. 22. Retrieved April 28, 2018. New cars draw over 50% more current than the old cars. Low voltage problems will result in reduced performance (i.e. no A/C in summer). ^ Mackenzie, Robert (September 29, 2008). "Streetcars Roll Along Fleet Street Tomorrow". Transit Toronto. Retrieved April 25, 2018. ^ a b Munro, Steve (April 27, 2018). "Problems With Trolley Shoes on Flexity Cars". Steve Munro. Retrieved April 27, 2018. ^ a b c Bow, James (October 13, 2018). "The Toronto Flexity Light Rail Vehicles (LRVs)". Transit Toronto. Retrieved October 19, 2018. ^ "Some TTC streetcars out of service due to cold weather". Canadian Broadcasting Corporation. January 8, 2015. Retrieved October 19, 2017. ^ Kalinowski, Tess (January 7, 2015). "TTC warns of chilly waits as cold freezes streetcar service". Toronto Star. Retrieved October 19, 2017. ^ "Nearly one-third of old streetcars were unable to leave yard due to frigid weather: TTC". Retrieved January 7, 2018. ^ Fox, Chris (January 5, 2018). "Frigid temperatures impacting transit service". CP24. Retrieved January 7, 2018. ^ Wilson, Codi (January 21, 2019). "Bitterly cold temperatures continue in Toronto". CP24. Retrieved March 15, 2019. ^ a b c "Service changes in the event of an ice storm". Toronto Transit Commission. April 16, 2018. Archived from the original on April 16, 2018. Retrieved April 16, 2018. ^ a b Kalinowski, Tess (January 6, 2010). "Transit City measures up to international standard". Toronto Star. Archived from the original on August 6, 2013. Retrieved August 6, 2013. TTC gauge is `English carriage gauge' and was used in Toronto well before the TTC was formed," explains transit blogger Steve Munro. "There were two purposes: One was to make it impossible for the steam railways to use city tracks and the other (alleged) was to allow carriages and wagons to drive on the tracks when roads were impassable due to mud. ^ a b "Frequently Asked Questions about Toronto's Streetcars". Transit Toronto. January 3, 2003. Retrieved October 21, 2017. ^ Kennedy, Raymond L. (2009). "The Junction and Its Railways". TrainWeb. Retrieved April 16, 2016. ^ Salmon, James V. (1958). Rails from the Junction. Lyon Productions. p. 7. Retrieved April 16, 2016. ^ City solicitor (1892). "The charter of the Toronto Railway Company". City of Toronto. p. 21. Retrieved April 16, 2016. ^ "Ashbridges Bay Light Rail Vehicle (LRV) Maintenance and Storage Facility". ttc.ca. Toronto Transit Commission. May 2010. Retrieved August 16, 2011. ^ Mallion, Godfrey (August 26, 2017). "Danforth Carhouse And Garage". Transit Toronto. Retrieved March 12, 2019. Gray, Jeff (June 23, 2005). "TTC to shop for new streetcars". The Globe and Mail. "Future Streetcar Fleet Requirements and Plans". Toronto Transit Commission. June 22, 2005. Livett, Christopher. "Toronto's Streetcar System (schematic track map)". Transit Toronto. "Opportunities for New Streetcar Routes" (PDF). Toronto Transit Commission. January 21, 1997. "North America – Canada – Ontario – Toronto Streetcar (Tram)". UrbanRail.Net. 2012. Retrieved July 26, 2013. Wikimedia Commons has media related to Toronto streetcar system.